The Tiger "breaks" the Tai Sui in 2019. "Breaking" the Tai Sui will result in one's life going haywire and behaving in a disorderly manner. All kinds of drastic changes will be observed in aspects of wealth, career, relationship, living environment and health. However, this will be a more promising year compared to the last. There are indications of good career prospects and increment in income. You are in "secret union" with Tai Sui, bringing you great interpersonal relationship with everyone and best terms with people. Fate will smile on you, enabling you to enjoy the fruits of your labor. If you desire some breakthrough in your career, it is time to seek partnership with someone trustworthy and passionate about the same vision for good tidings. Your chances of success are higher if you collaborate with someone whom you can trust. This is symbolized by the Sui He star (Tai Sui Union) denoting useful help from nobleman and blessed with excellent networking luck. You enjoy constant interpersonal relationship, thus paving way to get things done effortlessly. It will be a vibrant and awesome year with lots of opportunities coming from all directions. Next, you have the very favorable Tai Yin (Moon) star in your life palace. That means you will get useful help and assistance from powerful female figures. Female manager, business counterparts and customers will be giving you a generous helping hand to deviate the setbacks. You will take your career up a notch. You may start new businesses associated to female, such as cosmetic, skin care, ladies' clothing etc for better chance of success. Wealth luck continues to be good because Tai Yin star is a minor wealth star. Your financial investment ventures will reap profits. Sporadic windfall luck is also indicated if you are lucky. Equally positive, the Guo Yin star (National Treasure) denotes recognition, which brings about glimmering stairs towards promotion or authority in the office. Working people who draw salaries will benefit from it. You will be rewarded handsomely for all your hard work and effort you put in. On the downside, your good luck is tainted by numerous ominous stars. You will need to watch out for vile characters and properly screen through any document before giving your approval to any kind of project. Be prudent on what you write on Facebook and Twitter. This is due to the presence of inauspicious star Tian Guan Fu (Heavenly Officer Charm) star which can lead you to legal problems, gossips and arguments. On an equally bad note, Guan Suo star (Piercing Rope) suggests rumors and gossips that will pull your wealth luck down. You will need to watch out for vile characters and properly screen through any document before giving your approval to any kind of project. Avoid pushing towards dubious investment ventures. Next, you will also need to be more careful as the unlucky star Wang Shen (Death God) star will cause you losses in your personal belongings and potential robberies. You will also need to be cautious of the health of the elderly members of your family. To prevent you from putting on mourning cloths, you need to pay attention to the elderly and be mindful of preventive measures. Do not be lackadaisical or ignore this warning. Devote more time to be spent with your loved ones who matter most and remember that the lasting memories will be of family and love. On an equally bad note, you ought to highly beware that the Gou Shen star (Hook Spirit) will cause troubles in relationship and lead you to sexual traps. Troubled relationship is indicated. You may be nursing a broken heart or harboring love vengeance. Health wise, the presence of Cu Bao star (Disaster) indicates that you are likely to suffer from sudden illness or accidents. Love prospect wise, it will inevitably cause tears in your relationship. Singles who have not committed to relationships will feel lonely and self-centered. This spell is casted by Gu Chen star (Solitary) which will cause you loneliness and sadness. Tai Sui - Carry along with you the Tai Sui Talisman for protection. Display the Tai Sui Plaque in the NW. Display the Pi Yao Appeasing Jupiter at your work desk or by your bed. Use the Pi Yao Abacus Amulet to obtain fortune.. Remedy Illness Star #2 Black - Display the Twin Wulou in the NE. Elevate Career - Display the Pigs Discovered Treasure at your work desk or in your living room. Carry along the Heaven's Flag Amulet. Wealth Accumulation - Display the Mantra Enhanced Gold Bars with your portfolios. Dispel Vile Characters - Display the Chundi's Fan-Mirror in the west (direction of relationship) and the Fiery Golden Horse on Coins in the south (direction of gossip). Anti-Robbery/Violence - Display the 9 Lion Cymbals Ornament in the west or watching your main door from inside out. Safeguard Elderly - Display Safety Assured Ornament next to the elderly members' bedside. Let them carry along the Twin Wulou Amulet. 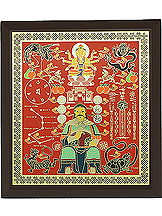 Anti-Accident - Display in your car or carry along the 8 Immortals Amulet when travelling. Love - Carry along or display the Nine Tailed Fox Amulet by the bedside.